Looking for ideas to stage a home for a quick sale? Then check out this HDTV video on staging a house to sell. There are many articles online that discuss how to stage a home for a quick sale. The laundry list of things to do can be overwhelming if you don’t set aside the time to do them prior to putting your home on the market. 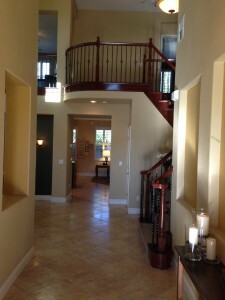 Staging is all about “depersonalizing” “Decluttering” and setting the stage for the buyers. Before putting your home on the market, you want to be sure the staging is perfect. ♦ Clear all unnecessary furniture from the house – don’t put it in the garage – get a storage unit. ♦ Keep accessories and objects on the furniture very limited. Groups of 1, 3, 5 items. This helps the buyer picture their furniture and their accessories. ♦ In the kitchen, clear all unnecessary objects from the countertops. Also clear everything from the refrigerator – the messages, magnets, pictures etc. ♦ In the bathroom, remove any unnecessary items from the countertops, tub, shower and commode top. Coordinate towels in one or two colors only. Keep only a few pictures on the walls – nothing personal. ♦ Review each room, clean, declutter, and depersonalize. Paint any rooms in need of paint, clean carpets and draperies if needed, clean the windows. ♦ Clean up all debris around the yard. ♦ Check the gutters and roof for dry rot and moss. Clean debris off the roof and clean the gutters. ♦ Prune all bushes and trees. Keep plants from blocking the windows. Remove all dead plants, weed all planting areas, and put down fresh mulching material. ♦ Keep your lawn freshly mowed and edged. ♦ Clear patios or decks of all small items, such as little planters, flower pots, charcoal, barbeques, toys etc. ♦ Check the condition of the paint on your home, especially the trim and the front door. Remember, the first impression or “curb Appeal” is very important! If you are thinking of selling your home, please give us a call. We can discuss strategy for Staging a Home to Sell and a marketing campaign so your house will sell in the least amount of time for the most amount of money.